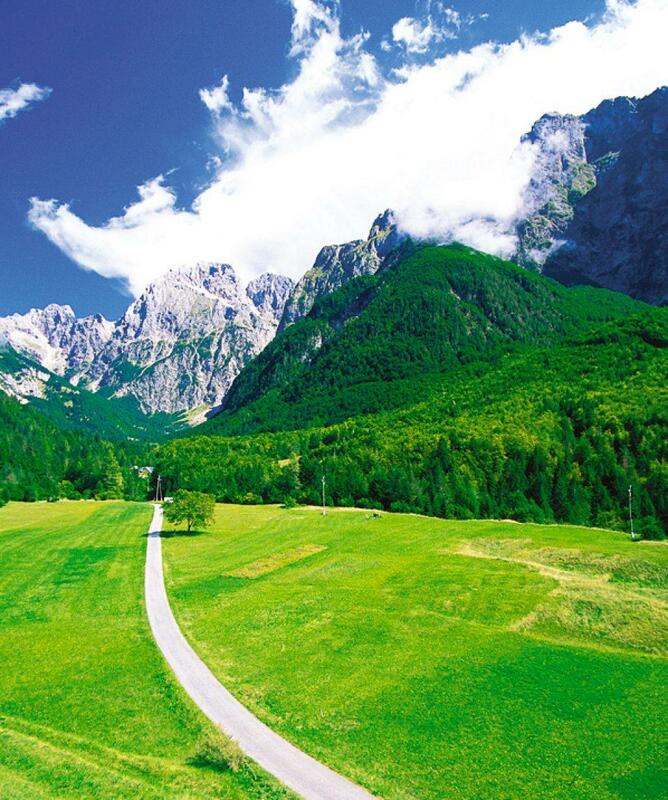 All about the Julian Alps Trekking – Slovenia. 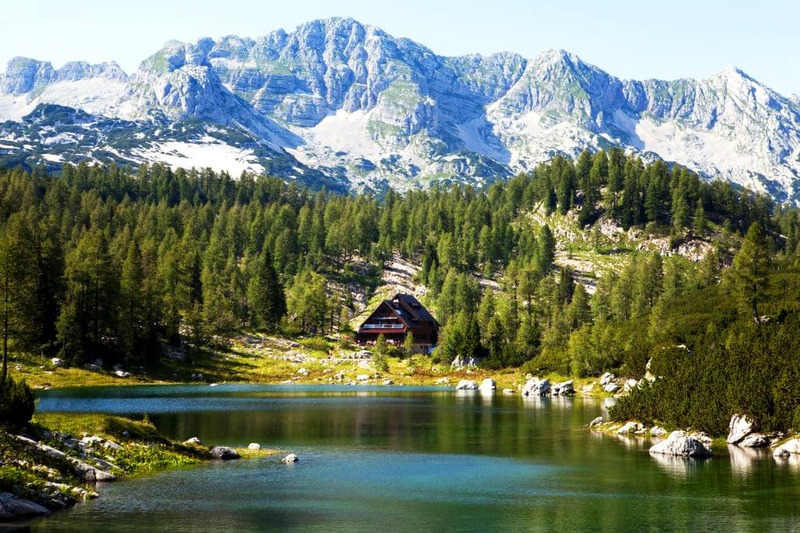 7-day active holiday in Slovenia with 5 days of hut to hut trekking in the Julian Alps, taking in the breathtaking scenery of high mountain lakes and majestic mountain peaks. 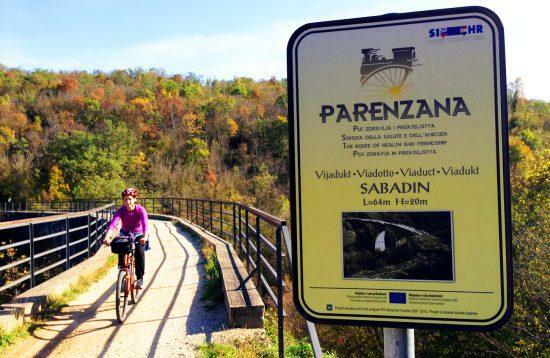 Slovenians proudly say that they live on the »Sunny side of the Alps« and one can easily see that the saying is true. 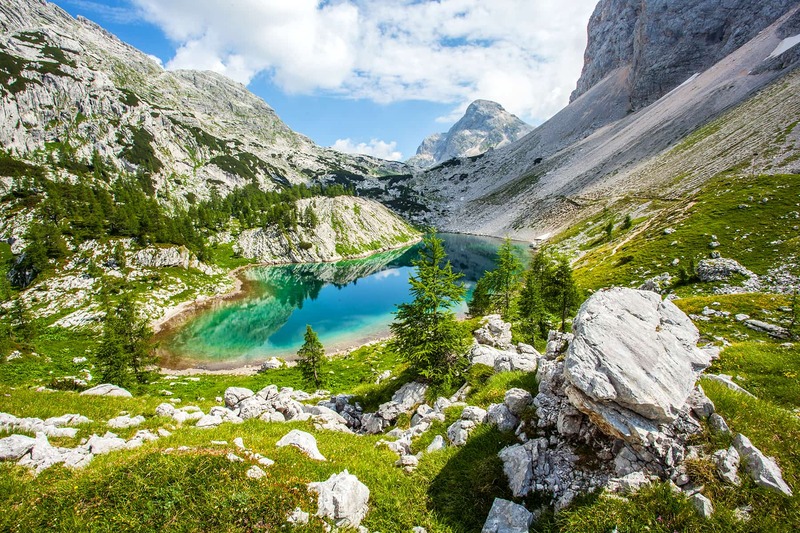 Julian Alps stretch in the north western corner of Slovenia, bordering Austria and Italy, and they offer numerous easy, moderate or difficult trails for hiking and trekking enthusiasts. 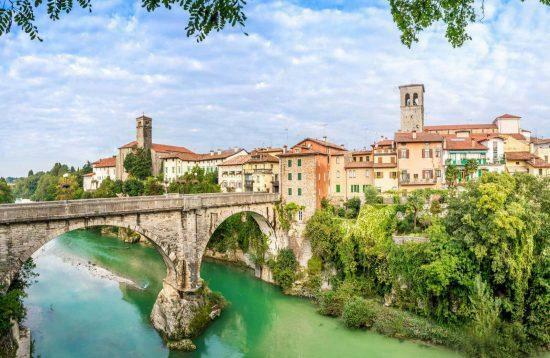 With high mountain lakes, rugged rocky peaks and green Alpine valleys, they offer some of the finest mountain scenery in Europe. 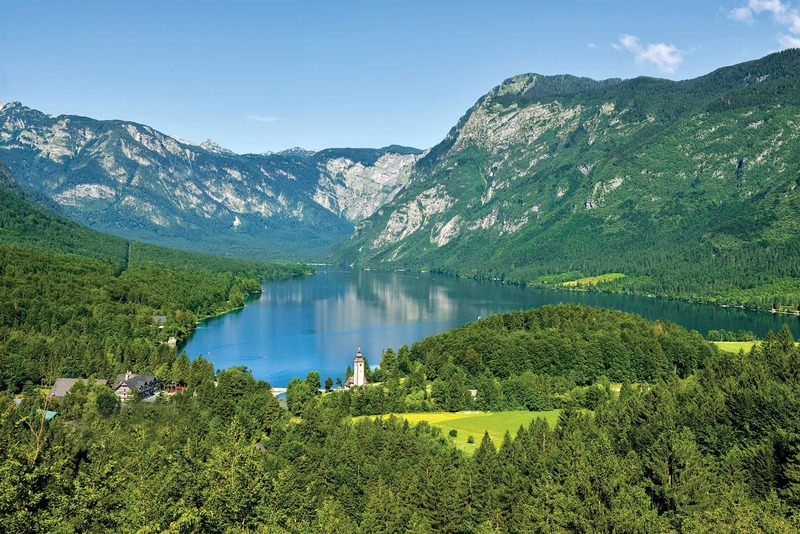 The tour will take you from the largest lake in Slovenia – Lake Bohinj (526m) up towards Mt Triglav, Slovenia's highest mountain at 2864m. You will have an option to ascend to the very top of this majestic »three headed« mountain or pass it below and continue further towards the Triglav Lakes Valley, one of the most picturesque Alpine valleys in Slovenia. Trekking from Lake to Lake and a peaceful walk by the emerald Soča river will bring you to the town of Bovec, which is well known to outdoor enthusiasts. After white water rafting on Soča river, a private transfer will take you from Bovec to Bled across the highest mountain pass in Slovenia – Vršič at 1611m. Your final day will be spent at Lake Bled, taking in the beauties of this well known Alpine pearl, located at the door of the Triglav National Park. 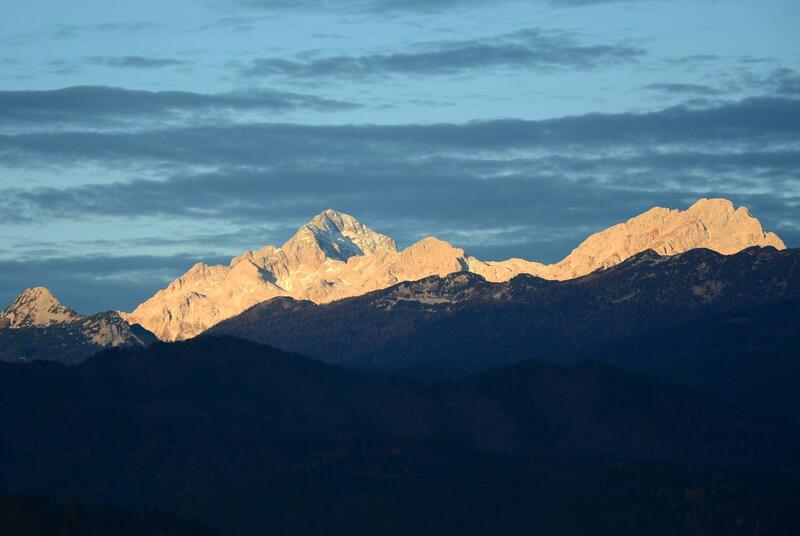 Option to ascend Mt Triglav (2864m) – the highest peak in the Julian Alps. Stay in rustic mountain huts (half-board) and 3* hotels (breakfast). Walking in Triglav National Park with Triglav Lakes Valley. Explore magic Soča Valley - "The Emerald River Valley". Optional White Water Rafting on Soča River (grade III/IV). 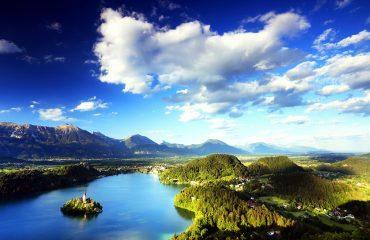 Visit the picturesque town of Bled and enjoy a swim in the lake. Optional easy Self guided Cycling around Bled (1 day bike rental). 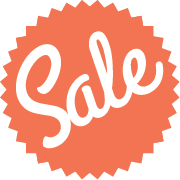 3 nights B&B accommodation in Hotels ***. 3 nights half-board accommodation in mountain huts. Private transfer from Ljubljana to Bohinj (day 1). Private transfer from Bovec to Bled (day 6). Luggage transfer from Bohinj to Bovec (day 5). Private transfer from Bled to Ljubljana (day 7). Optional 1-day rent-a-bike at Lake Bled. Optional 6-day rental of walking equipment (hiking poles, backpack, basic rain jacket). Food and drinks: lunch on all days (approx. 10-15 eur/meal) and dinner when staying in hotels, drinks with all meals. Purchase of single-use sheets at the huts (2,50 eur/set). The use of sleeping sheets is obligatory at the huts. You can either bring your own or buy single-use ones. Blankets are provided free of charge at the huts. Luggage transfer between mountain huts (you carry your gear for mountain trekking from day 2 to 5). Via ferrata gear hire for Mt. 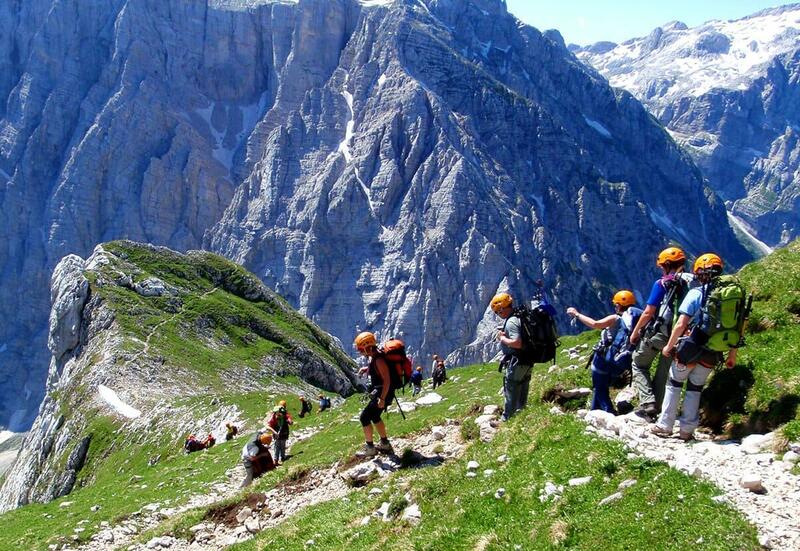 Triglav ascent (helmet, harness, via ferrata set): 30 eur/person. 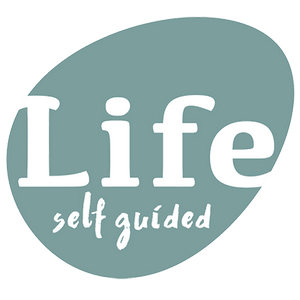 Guided ascend (IFMGA mountain guide) of Mt. Triglav on day 3: 145 eur/person supplement (at 2pax). White Water Rafting on Soča River on day 6: 48 eur/person for 2-3 hour trip. Day 1 Transfer from Ljubljana to Bohinj (2h) and hike around the lake (3h). Upon arrival to Ljubljana city or Ljubljana Airport, you will be transferred to Lake Bled, where you will have a short stop for a briefing. 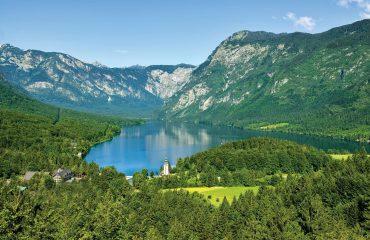 You will then be transferred further on to Bohinj Lake, the largest glacial lake in Slovenia. The lake is 2 kilometres wide and 6 kilometres long, with the 12,5- kilometre hiking path that circles it. It lies in the centre of the Triglav National Park and occupies a dramatic position surrounded by a spectacular mountain ridge. We recommend you take a walk around the lake (approx. 3 hours) for a nice and easy warm-up to your trekking tour. Overnight in a hotel*** in Bohinj, breakfast included. Day 2 Moderate hike to Planika Mountain Hut (7-8h). After breakfast, the walk begins from your accommodation towards village Stara Fužina and further on up, following the Mostnica stream to reach the Mostnica Gorge, where you will pass through a series of canyons. There are some excellent views to the cascades and rapids before the trail opens out to the Voje Valley. This section of the walk passes by meadows and small settlements and later on through a beautiful forest to the Grintovica alpine meadow at around 1200 m. As you ascend, the views open out to the surrounding mountains. Take a break at Vodnik Hut, where you can order a warm mountain meal, before continuing along the Vernar peak (2225 m). In about two hours of hiking you will reach Planika Hut where you will spend the night. Overnight at a mountain hut. Dormitory room, half board. Day 3 Optional Mt Triglav ascent (3h). Triglav Lakes Valley walk (6hr). This morning you have an option to make a via ferrata ascend up to Mt Triglav, which takes about 3 hours in total or to walk below Mt Triglav towards the Dolič Mt Hut. Via ferrata climb is a steep cliff path that has steel cables fixed along the ridge line with steps to the top. Traversing the ridge offers on a clear day magnificent views of surrounding mountains. If you would like to conquer the mountain top with a guide, it must be booked in advance and the guide will meet you in the morning at Planika Hut. After enjoying the marvellous views from the top of Mt. 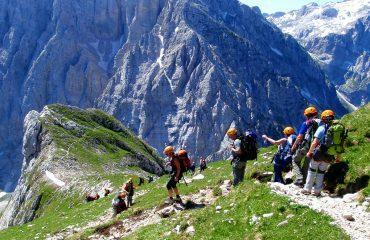 Triglav, you will start your descend towards the well-known Triglav Lakes Valley. 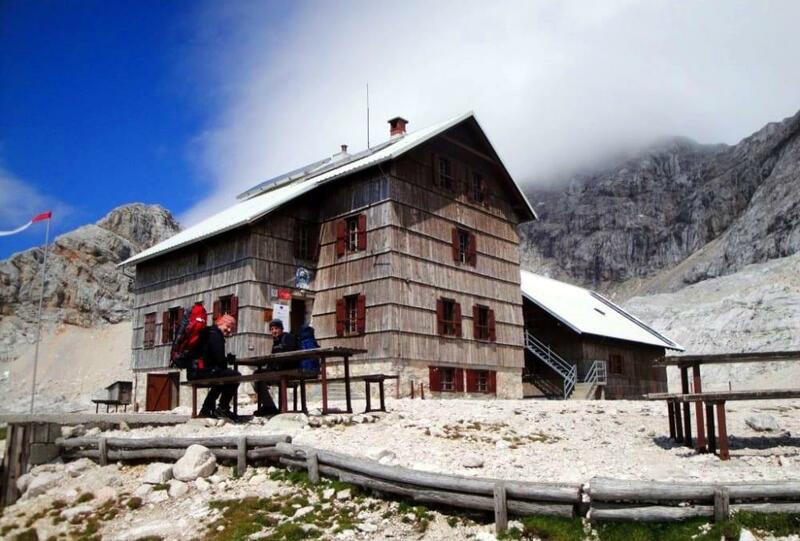 The main section of the walk passes several lakes and ends at the Triglav Lakes Valley Hut, where you will spend the night. The trail has some steep sections traversing narrow ledges where a handrail has been installed. 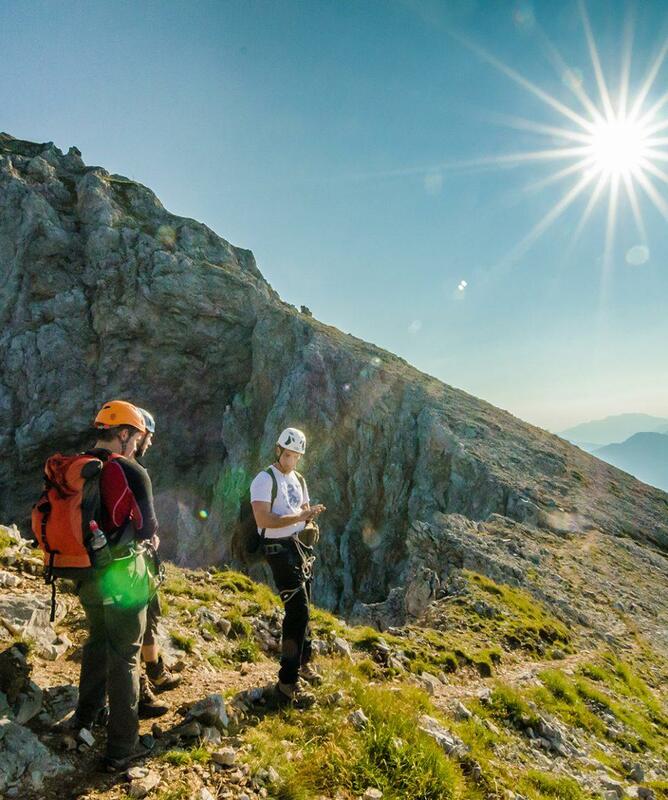 As you continue, you will cross the Dolič Saddle (2164 m), before reaching Hribarice Plateau. Soon after you will walk into the Triglav Lakes Valley. Day 4 Hut to hut walk through the Julian Alps (8-9h). Today's walk takes you from hut to hut towards Mt. Bogatin area, made famous by Hemingway’s “Farewell to Arms”. You have an option to stop along the way at Komna Hut for a warm meal. The path further on takes you across Vratca Saddle and towards Krn Lake Hut, where you will spend the night. The nearby Krn Lake is a great place to enjoy the rest of the day. Day 5 Descend to Trenta Valley and walk along the Soča river to Bovec (5-6h). The final day's walk is a descend from Krn Lake to Lepena Valley and on the Soča Trail all the way to Bovec (3 hours). The emerald Soča River is regarded by many to be one of the most beautiful rivers in Europe. It flows through narrow gorges and over broad gravel beds. 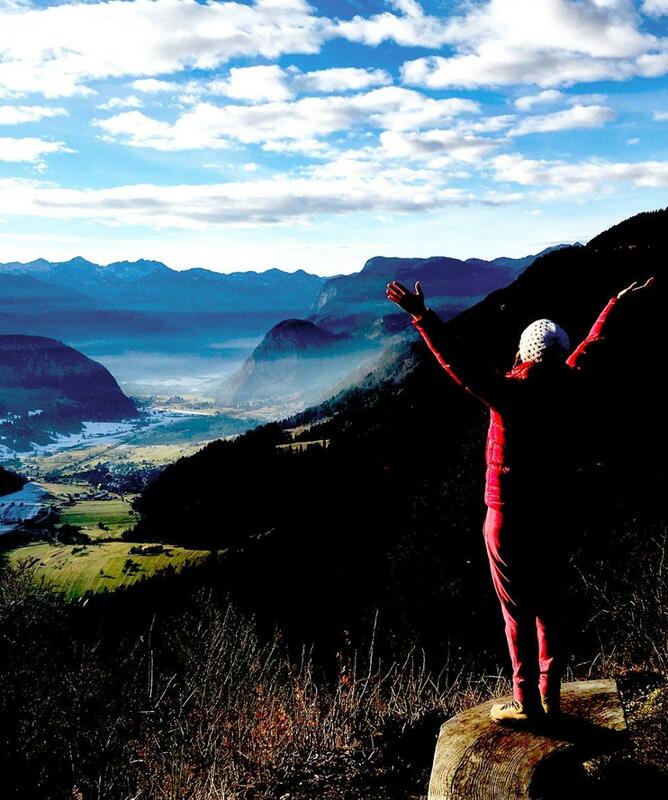 Afternoon is free for you to explore the small town of Bovec, well known to outdoor enthusiasts. Accommodation in a hotel*** in Bovec, breakfast included. Day 6 White Water Rafting on Soča River (2,5h) and transfer to Bled (1,5h). Optional White Water Rafting on the emerald Soča River in the morning hours with pick-up at your accommodation and later on, after optional lunch in Bovec, a scenic transfer to Bled via Vršič (1611 m), the highest mountain pass in Slovenia. 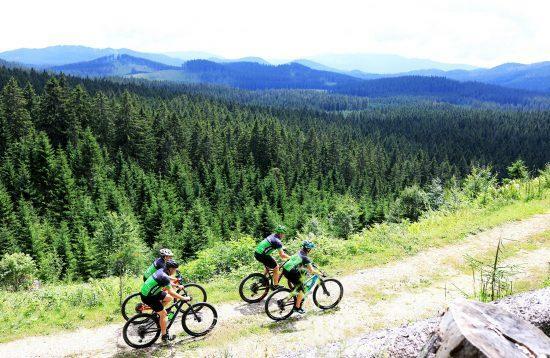 Remainder of the day free for sightseeing with optional rental of bikes (for a visit of the Vintgar Gorge) or a short hike up to the Osojnica viewpoint. Bled is an Alpine pearl, standing at the doorstep of the Triglav National Park with a picturesque lake that has an island in the middle as well as an impressive, over 1000 years old castle that stands on a rock wall above. Accommodation in a hotel*** in Bled, breakfast included. Day 7 Transfer to Ljubljana Airport (1h). Accommodation is in a combination of 3* hotels (comfortable with en-suite) and mountain huts. Mountain huts are basic, generally with excellent mountain views, hearty cuisine and warm atmosphere. In the mountain huts you will generally sleep in dorm rooms with 5-30 people. There are no showers in the mountain huts (with the exception of Komna mountain hut, which you will pass on day 4). Meals can be ordered in hut's dining room. You can purchase picnic lunch supplies in towns before the tour or purchase lunch from accommodation providers the night before. It is always good to have snacks and energy bars with you, particularly when you are staying in the huts where supplies are limited. Day 1: 3* Hotel in Bohinj (Double/twin room with breakfast). Day 2: Planika Mountain Hut (2401 m) / Dormitory room, half-board. Day 3: Triglav Lakes Mountain Hut (1685 m) / Dormitory room, half-board. Day 4: Krn Lakes Mountain Hut (1385 m) / Dormitory room, half-board. Day 5: 3* Hotel in Bovec (Double/twin room with breakfast). Day 6: 3* Hotel in Bled (Double/twin room with breakfast). What kind of footwear is most suitable?What the prices of food and drinks at the huts?What is good to bring along? Which equipment do I need?What is the weather like?How demanding is the tour?Tips and suggestions?Do I need insurance?What kit is provided? Most meals and drinks in mountain huts have regular prices, but water, soft drinks and beer are more expensive than in the valleys. 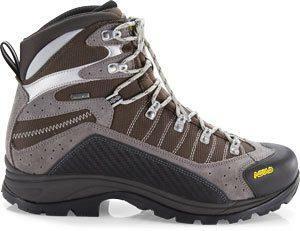 Shoes – hiking boots with ankle support. Jacket – wind & waterproof, softshell. Sunglasses, sunscreen, lip balm, any other sun protection. Food - snacks, granola bars, chocolate (optional - can be bought at mountain huts). Backpack – lightweight, strong and durable material, adjustable straps (size: approximately 60-70l). Never underestimate extreme and unpredictable mountain weather. Come prepared for any weather conditions. Keep in mind that you will spend your days high in the mountains. Even on hottest summer days, the weather in the mountains can change quickly. Thunderstorms are relatively common in July and August. They develop rather quickly, but usually build up in the late afternoons and evenings, so it is best to start hikes early in the morning. 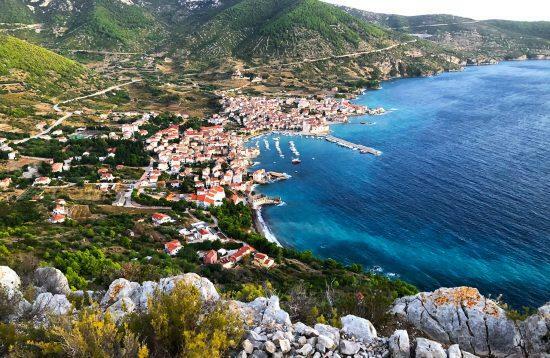 The hike is considered a challenging activity with an optional demanding climb to Mt. Triglav. Although certain parts of a trail may seem easy due to low incline, they do demand high level of endurance and can be challenging for those, who are not used to longer hikes. The optional climb to the summit of Mt. Triglav is via ferrata (italian for “iron way”), which is an extremely steep climb on steel ladders and steel wires and is not recommended for people, who are not in good physical condition or are afraid of heights. The climb is also not recommended for children younger than 15 years and pregnant women. All travelers are required to notify us before booking the tour of any medical conditions they might be suffering from, as well as dietary restrictions. All medications can and should be brought along. If you suffer from any medical conditions, we strongly suggest that you consult your physician before booking a tour to receive an expert medical advice. We are more than happy to discuss and recommend the most suitable adventure for you based on your conditions, but cannot carry a responsibility for your health. And last but not least: everyone, who climbs Slovenian peaks, hikes Alpine meadows, or takes a dip in crystal clear rivers, must understand and remember that Slovenians hold nature very close to their hearts and are as a nation devoted to protecting its beauty and health. Please, respect mountains and valleys, don’t litter, do not be wasteful, or loud, do not pick flowers along a hiking path, keep away from wild animals. And enjoy the pristine nature that is all around you! You will be provided with full via-ferrata climbing equipment (helmet, harness and self-belaying device. Upon request you can also be provided with hiking backpack and/or hiking sticks. Myself and three other friends did the 5-day self-guided trekking across the Julian Alps. Starting with email communication, the staff was responding quickly and giving us all needed. We already felt in good hands with them! On day of our arrival we had welcome meeting, where we got booklet with all information to complete our trekking. The staff again took time to discuss every single detail about the tour. The route description was very accurate and went along the map where the path was marked. 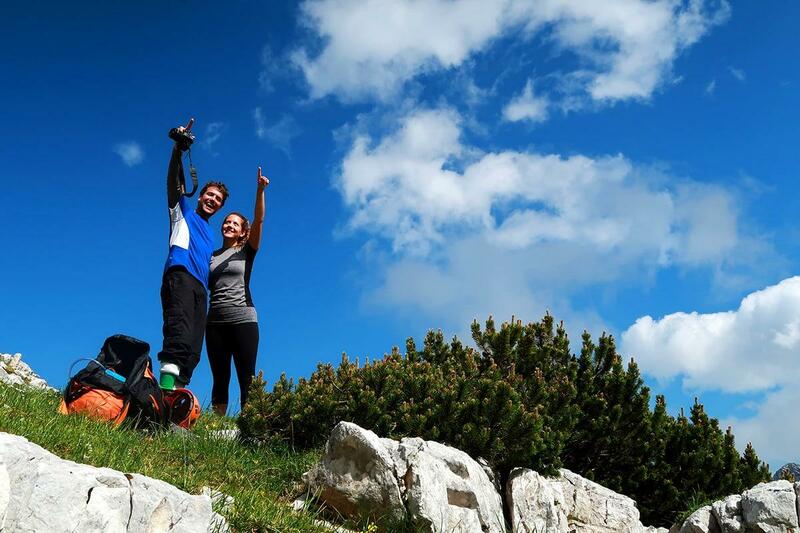 On day 3 we reached the summit of mount Triglav. What an achievement! At the end of our trekking we reached Soča valley and also did rafting on the river. The river was not too wild, but it is a great experience of this beautiful river. During trekking we stayed for 3 nights in mountain huts, in shared bedrooms. We also got breakfast and dinner (cooked meals! ), so we only needed to take care of lunch during each day. In valley our accommodation was in small hotels. Overall the tour was spectacular experience for everyone in our party. LIFE Adventures are really professional, they made us feel safe, even when actually being alone on tour. I would gladly recommend them to everyone!